A handsome SSD that functions as part of your PC's RGB lighting scheme, but its sustained write performance is weak. For a long time I've held up Kingston's HyperX Predator SSD as an avatar for the overall great 2.5-inch SATA drive. Now there's the hefty HyperX Fury with its gamer-oriented RGB lighting. It looks and feels (in the hand) great, and also performs great on our synthetic benchmarks and in light everyday use. But I'm still on board with the Predator. The Fury RGB is a great drive most of the time, but its sustained write performance drops drastically with large amounts of data. 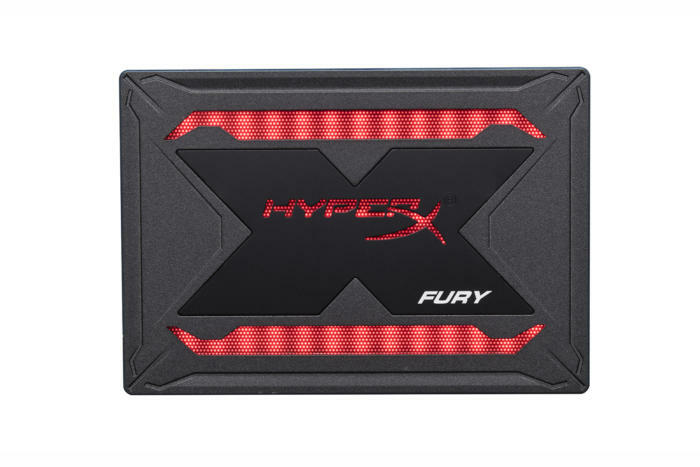 The most noticeable thing about the HyperX Fury out of the box, is its hefty six-ounce weight. As it will undoubtedly be heading inside a gaming machine, and not a laptop, this is no big whoop. It actually gives the drive a quality feel to it, and if your game of choice is violent, it would make great ammo for a slingshot. The Fury RGB has onboard LEDs that can be controlled by RGB (light show) motherboards. Once installed, it's the RGB lighting on the top of the drive that will catch your eye. Either as a glow through your air vents, or directly behind the transparent panels. The SATA 6Gbps Fury interfaces with other RGB devices. If your motherboard supports lighting FX, it can participate in the light show. 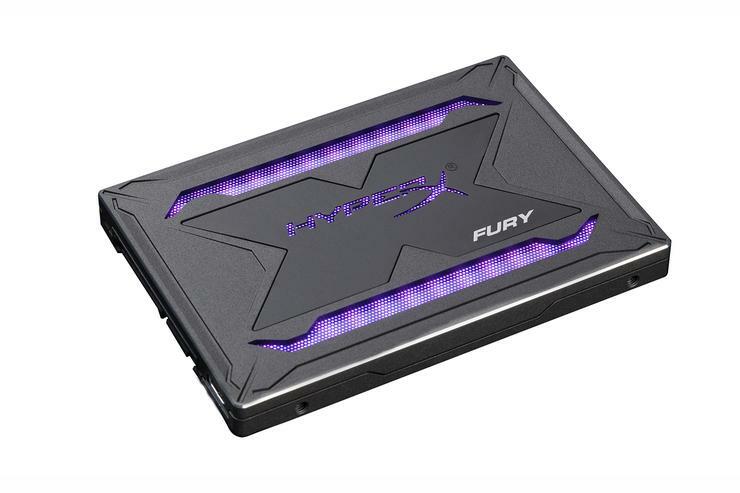 The Fury RGB is available in 240GB (available on AmazonRemove non-product link), 480GB (the capacity we tested, available on Amazon), and 960GB (available on AmazonRemove non-product link). That's rather pricey, but discounts will hopefully ensue. The drives are warrantied for three years, and use 3D TLC NAND driven by a Marvell 88SS1074 controller. For most tasks, the Fury is a fast SSD. "Most tasks" ends at writing larger amounts of data. First I'll show you the good, then the bad. The good is the score the drive racked up on CrystalDiskMark. AS SSD 2.0 (not shown) showed similar results. 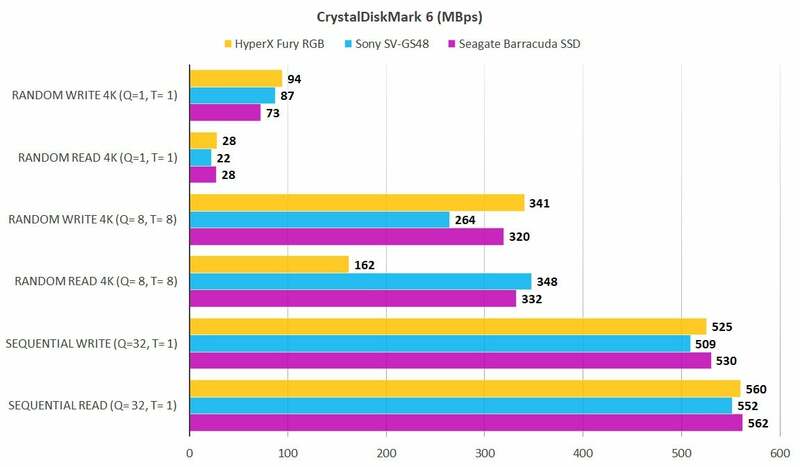 CrystalDiskMark rated the Fury RGB (gold bars) as largely equal to the other SSDs. It's not when you start writing large amounts of data. Longer bars are better. Where the Fury was spent was in our 48GB copies (shown below). After the first few gigabytes (we tested the 480GB drive), when the SLC cache was full, the throughput level dropped to a steady 150MBps to 170MBps. While not exactly tragic, as some early TLC drives were, that's not very good. Recently vendors have taken to varying the way they write data (using the TLC as SLC or MLC) to sustain write speed for a significantly longer amount of time. They then re-write as TLC when time allows. HyperX doesn't seem to have implemented anything along these lines. When it came to writing large amounts of date, the Fury RGB (gold bars) was a disappointment. Shorter bars are better. One other note: The Fury ran very warm during our tests. We didn't have a fan blowing on it, but we've never had the need. The RGB lighting seemingly adds to the thermal load, or perhaps the extra structure inhibits heat dispersal. Whatever the reason, mount the drive in a well-ventilated location. You're paying a lot for looks and lights with the Fury RGB. If lighting is your thing, then by all means. It's fast the vast majority of the time and will run your operating system just fine if you can't afford an NVMe drive. 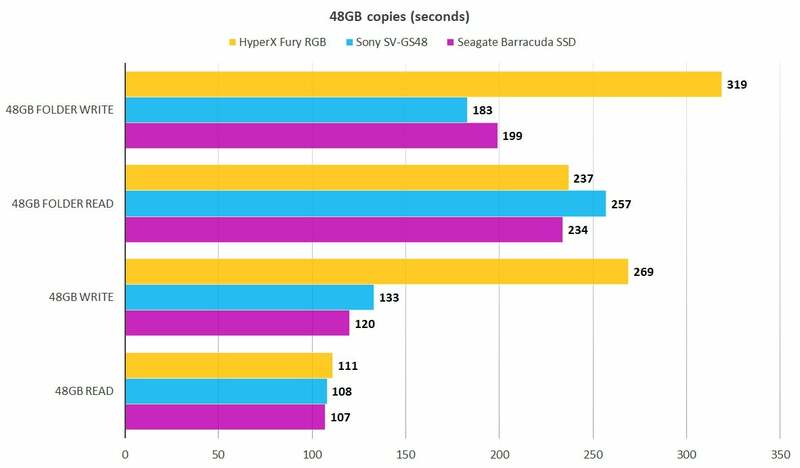 But when you copy large amounts of data to it, it's a mediocre, somewhat pricey, misleadingly named SSD. Fade to black.